Presiding majestically over the capital area is Hallgrímskirkja - the crowning landmark and star attraction of Reykjavík city. Its iconic tower rises symmetrically and incrementally to a magnificent 74.5m peak and stands powerfully erect atop the rising heights of Skólavörðustígur – arguably one of the city’s most attractive locations. Not only a significant point of reference for visitors to Reykjavík, but also an exceptional observation tower offering incredible panoramic views across the whole of the city. 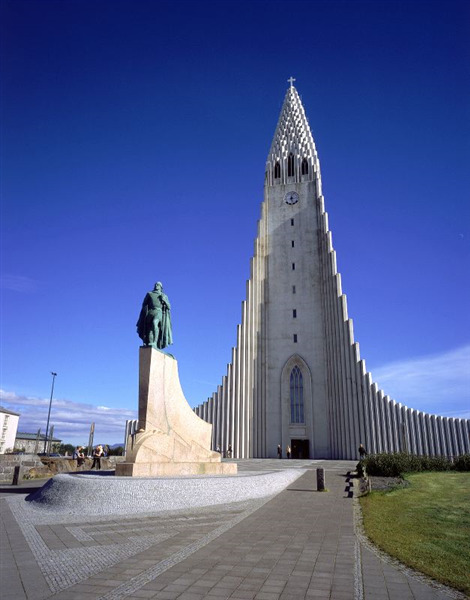 This magnificent construction was designed by the late Guðjón Samuel in 1937, who was often inspired in his endeavours by the fascinating shapes and forms created when lava cools into basalt rock. Construction of the church began in 1945 and ended in 1986, with the tower completed long before the rest of the building. The crypt beneath the choir was consecrated in 1948, the steeple and wings completed in 1974 and the nave consecrated in 1986. The church features, most notably, a gargantuan pipe organ designed and constructed by the German organ builder Johannes Klais of Bonn. Standing tall at an impressive 15m and weighing a remarkable 25 tons, this mechanical action organ is driven by four manuals and a pedal, 102 ranks, 72 stops and 5275 pipes, all designed to reproduce powerful notes capable of filling the huge and holy space with a range of tones - from the dulcet to the dramatic. Its construction was completed in December 1992 and has since been utilized in a variety of recordings, including some by Christopher Herrick. Standing guard and gracing the grounds in front of the church, which it predated by 15 years, is a fine statue of Leifur Eiriksson (c. 970 – c. 1020) – the first European to discover America. Records suggest that Leifur landed on the shores of the new world in the year 1,000 A.D., that's 500 years before Christopher Columbus. The statue, which was designed by Alexander Stirling Calder was a gift from the United States in honour of the 1930 Alþingi Millennial Festival, commemorating the 1,000th anniversary of the establishment of Iceland's parliament at Þingvellir in 930 AD.